Tired of drinking water all day? Don’t need the extra calories? I had a Canada Dry Sparkling Water with lunch today. It was my first time, but not my last. Sometimes you need to mix it up without adding sugary sodas to your diet. Check it out. 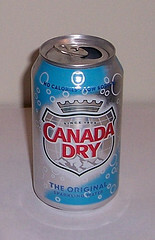 This entry was posted in Food & Drink and tagged Canada Dry, Water. Bookmark the permalink.